Today, September 25, 2010, Richard DeNapoli, Treasurer of the Broward Republican Party, had the pleasure of attending the Marco Rubio rally breakfast in Coral Springs. Richard, along with other volunteers, made hundreds of calls on behalf of Marco Rubio’s campaign. Richard previously attended the Reclaim America Town Hall on July 31 in Fort Lauderdale featuring Marco Rubio and Eric Cantor. 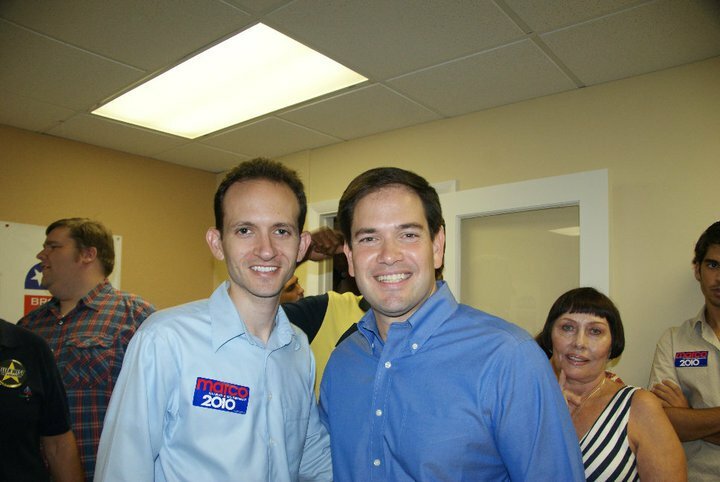 Richard is proud to support Marco Rubio, the Republican nominee in this November’s General Election. Marco is the Republican nominee against former Republican Governor Charlie Crist, who is running as an independent, and Kendrick Meek, the Democrat nominee, in the November 2010 General Election. As we approach election day on Monday, December 6th, I wanted to share with you my Volunteer Resume. I have been committed to our party and the conservative cause as aGrassroots Volunteer & Activist for more than 10 years in New York and Florida, and look forward to serving you as your Chair. 2008 – Volunteer, Giuliani Presidential Campaign; Volunteer, John McCain after primary – made thousands of calls from the Southeast Victory Office, contributed, attended events all over the county for John McCain. I always support our Republican nominees. May 2010 – Elected Treasurer of BREC. Total funds raised in 2010 after May 2010: $40,000. Funds raised in 2010 prior to May: $2,480. June 2010 – Issued fundraising challenge at BREC meeting, matching any contributions personally up to $500. August 2010 – Co-sponsored and moderated the Congressional 20 Republican Candidates debate, with over 200 attendees. Pledged as a BREC Officer and a local club President not to endorse any candidate in the primary. Supported Republican nominee Karen Harrington after the primary. I always support our Republican nominees. August 2010 – Attended Super Saturday Meet Marco Rubio at BREC Headquarters before the primary. August 2010 – I proudly supported Bill McCollum in the primary – my commitment to his campaign began prior to my time as BREC Treasurer…and when McCollum lost I proudly supported our Republican nominee and now Governor-Elect Rick Scott. I always support our Republican nominees. August through November 2010 – Walked for George Moraitis after the primary. Served on Moraitis host committee for fundraiser. August 2010 – Helped set up the Northwest Victory Office, setting up computers, furniture, etc. October 2010 – Broward GOP Victory Dinner. Worked with Board to raise money for BREC’s support of our local candidates. Raised about $20,000. Election Night 2010 – Sponsored with my own funds the Broward GOP Election Night Victory Party…more than 100 attended.